In this episode, Jessica and Scott Francisco, Director of Pilot Projects, discover a mutual fascination with the unloved city parking garage and explore what a current design for today’s urban neighborhood might look like. 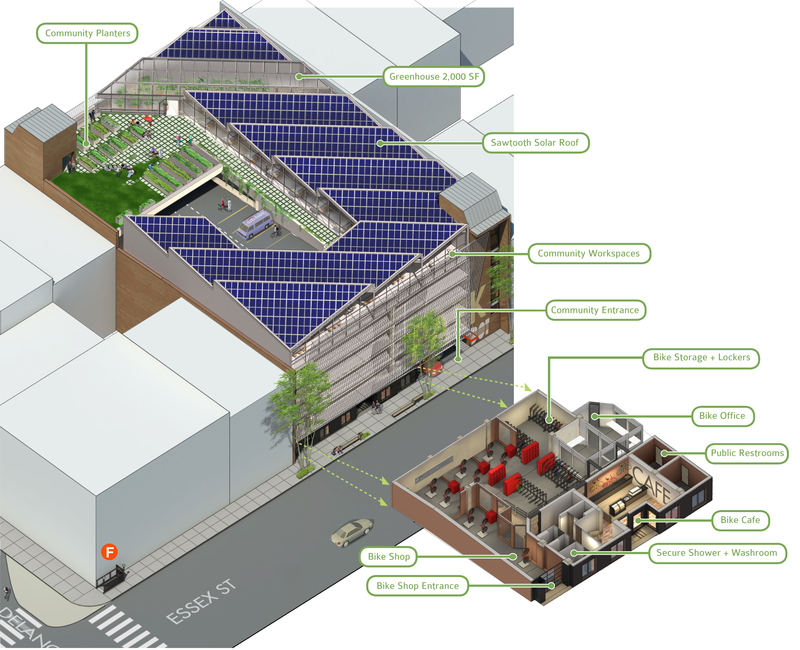 Pilot Projects’ Green Hub concept is an adaptive reuse that reimagines parking structures as vibrant community spaces with parking for bicycles, coworking space, a cafe, and even a rooftop garden with solar panels. Scott and the team partnered closely with a number of community organizations in New York to put this design together, and we hope that a network of parking garages like the Green Hub will eventually be built. Jessica: Scott, it is so good to talk to you this morning. I have to confess that we are about to dig into one of my favorite topics but it’s an obscure one for sure, and that’s parking garages. Welcome, and thank you for joining. Jessica: Yeah. 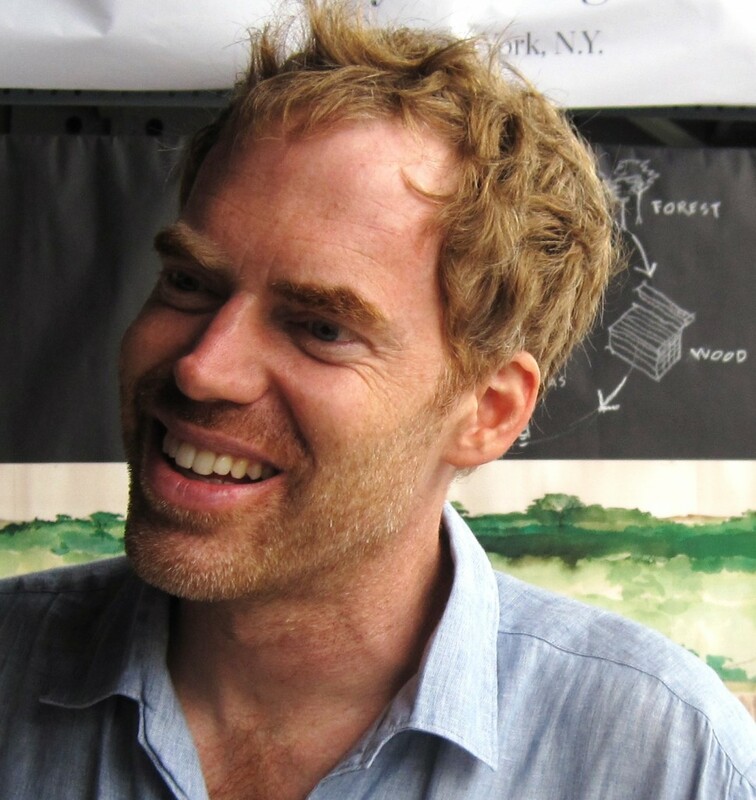 Scott, you’re the Director of Pilot Projects out there in New York. I was looking at the website, and I see you guys describe the work that you do focus on people, spaces, culture and infrastructure and certainly parking garages are one of those pieces of cities that we don’t often think a lot about and don’t appreciate. Thank you again for joining me on this journey today. I’ll give a little context here; the reason I love parking garages so much is I spent a ton of time in them when I was managing parking for Zipcar out in San Francisco and had a chance to see lots of different designs and think about the neighborhoods that they were located in. When I heard about the Green Hub project that you guys are working on I just had to hear more. Tell me first a little bit more about Pilot Projects and how Green Hub came to be and what exactly are you thinking about for parking garages today and in the future. Scott: Jessica, we have something in common that’s our love of parking grudges because I also have a bit of history with them. When I was a very young architecture student, I spent a summer doing assessments of parking garages for an engineering firm where we dragged chains around on the surfaces to test whether the concrete was still intact. I spent a whole summer in parking garages in Canada. We’re also avid bikers and are involved in some bike related projects. 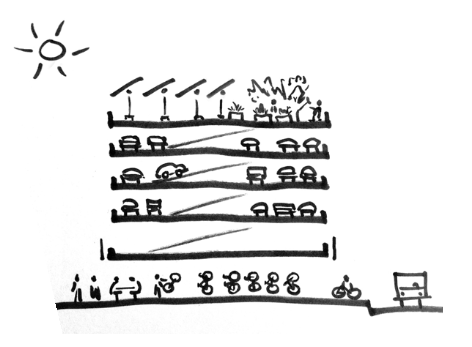 One of the first things we thought about is how we could bring bicycling and bike culture into this parking structure. Why has it just for cars? It seems completely out of sync with the way the city is going and the way neighborhoods are embracing bike transportation. Jessica: That’s so interesting to me how you’re bringing it back from just being a place for cars to other modes of transportation, but more in the neighborhood, right? Scott: Absolutely. We as a cyclist here in the city are always struggling with where you park your bike, how you park your bike, is it going to get stolen, is it going to get wet, is it safe, is it convenient. Given that they’re so much density here in this neighborhood it seemed like the hub for awesome bike parking would be such a great asset to the neighborhood. Here’s this structure, and at the ground level there’s almost nothing going on. Parking structures are known for contributing almost nothing to the streetscape at the pedestrian level. In fact, that space right along the sidewalk in this particular case was just a blank wall. We thought, “What if we could just open that up and create a kind of concierge’s type bike parking, where you have the ultimate place to park your bike right at the sidewalk level and really show it off so that it added something to the pedestrian experience as well.” Meanwhile, you’re connecting the use of parking space with cycling. Some folks who are coming in and commuting by car are incentivized to drop their car off and take a bike and use the bike as they navigate around the city. Jessica: Yeah. It’s so funny that you brought up the experience of the parking garage from the street. As I was thinking about our conversation, I did a little bit of digging into the history of parking garages. There was this interesting show at The National Building Museum a couple of years ago, but it went through the history of parking garages as architecture. A couple of things actually really surprised me. One was that when parking garages were first invented in the early 1900s they actually looked like buildings on the street and they were designed to fit into the neighborhood. More than that they actually in some ways maybe had more technology than the garages that we’re familiar with today. It sounds like you drove your car up and there was a valet, attendant there who would receive your vehicle and then load it into an elevator, which would then take it up into the building and park the car somewhere. Only in the ’50s did there become this expectation that we would drive our vehicle into the garage and self-park. When you had this self-parking, it actually created a need for the bigger open decks that we’re familiar with today and that ugly thing facing the street. We actually went back in a way from the efficient storage. Today we think about robots parking cars in super fancy garages. That’s actually where parking garages started. I was really surprised to see that. As we think about a Green Hub garage or a garage of the future re-connecting it to not just the experience on the street, but also what people demand of the use of that space, I think is quite a fascinating conversation. If you walk through New York, Detroit, any city where we have this prevalence of parking garages you realize that they have some of the best real estates in the city, and we’re using it to store cars and do nothing else. Again, that’s why I was just fascinated not just with the bike parking, but some of the other things that you envision for Green Hub. Can you talk a little bit more about what else might be in the facility? You mentioned electric vehicles, but how else might this space, of a parking garage be used? Scott: So in our first studies we realized that if we could displace only 14 cars we could put in not only some substantial bike parking with the valet service, a bike shop, a place for maintenance, and possibly even sale of bicycles so really bring the whole bike movement together in one place that had sidewalk level store fronts so very visible to everyone around. Let’s say that that also becomes a kind of a café. This is a place where you can get your morning coffee, you can hang out, you can talk shop with people, you can just intercept with people as cafes always allow. In this case, it’s centered around sustainable transportation. There’s an opportunity for a really social aspect to not only bicycling but all the components of city life that are important and bring them together with the theme of bicycling and transportation. We also looked at the structure and saw that the roof deck was very underutilized. In fact, it was the least desirable place for people to park their cars. There’s very rarely anyone parked on this roof deck even though this is in a very busy part of the city. We thought, “What if we could create a kind of micro-community garden on this roof deck with raised planter beds.” It would actually be pretty easy to move. There could be one parking space each. We did a calculation and figured we could get at least 20 planter beds up there. We can create some room for solar [inaudible 00:10:28] solar collection for some of the parking spaces that remain up there, so create a sun shade and a solar collector and power all of this new infrastructure that we’re adding here with solar power. As the community got more interested in this, the Business Improvement District commissioned us to explore this even further and looked at putting light weight office space. Basically adding temporary structure to this roof that would allow for community groups to meet and work. Kind of a co-working space for the community on this roof that would be connected to that garden space. The whole thing started to unfold into a concept of connecting people from different sectors in the community with transportation, making it visible, making it beautiful, and connecting back to what you were saying about the way parking structures used to be, they felt more integrated into the city and the culture of the city as a building that was bringing life and beauty to the city. Now we think of parking structures as these dark, ugly space wasting structures, and devoid of people really even though in fact people are using them they don’t feel like they have any kind of human scale to them. It’s just cars are driving in; cars are driving out. By adding different kinds of activities, different programs to the building you really just change its whole aesthetic and accessibility. 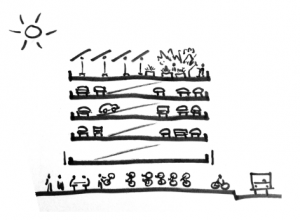 We were thinking, “Well, what if this became an approach to dealing with parking structures in urban centers all around the country, every major city in America, and not just the major ones. Parking structures are everywhere, and we could start exploring this as a theme that could be really creating a network of Green Hubs all over, so when you came to a new city you could count on the fact that there would be this place to go.” Let’s say you needed to use a car, rent a car, share a car this would be a place to go, and while you’re there, you have access to these other types of transportation. When someone comes to Detroit, for example, most people that arrive in Detroit as a visitor probably rent a car. Scott: The idea of renting a bike or using a bike in Detroit is probably pretty foreign to the average visitor. If something like Green Hub existed you’d suddenly have the opportunity to put that option in front of people and make it feel more accessible, and seeing other people doing it, and I can get a coffee and something to eat while I’m exploring my options. Hearing from some other people like, “Can you bike throughout Detroit.” Once you hear some people talking about it, it feels a lot more accessible to you. Jessica: Sure. I think something you mentioned earlier about parking car and then continuing on in a different way, even if, for instance, in Detroit you did rent a car from the airport, or take a car, what if that were one way and it got you into the city, and then you left it behind and continued to explore either on foot or bike sharing or even on public transit, right? Jessica: You don’t necessarily need a car for every piece of that trip when you’re visiting a city or getting around during the day. Scott: Ideally, these are located as close as possible to public transport, so you’ve got the public transport network basically intersecting with these other means of transport. We know that the car isn’t going away any time soon. What’s exciting is that the way we’re thinking about cars these days is changing. We’re thinking about the way they use energy different ways. From that electric vehicles to hybrids, to self-driving cars, if you think about those technologies all merging you really want a social space where people can talk about these things as well. Culture change is really at the core of what we’re trying to do here and creating a place for conversations, testing, piloting, visibility and have the icons of that change so people can see it and feel it and start to talk to people about it that may have never been exposed to it before. It’s making it visible. How do you make these ideas that are in many people’s heads, but can we see them at work? Especially in a place like Detroit where you’ve got things are little bit spread out right now and to go to place where numerous concepts and ideas existed in one place, you really intensify the possibility for people to believe basically that it’s possible. Jessica: Sure, yeah. It’s so interesting. I feel so lucky in the field that I work in. The things that we thought were so far off in the future, technologies. Even electric vehicles a few years ago was still kind of a science fiction to many. Now, we start to see commercials on TV during March Madness for electric vehicles, and solar, the preference there. We really are in the era where this technologies they exist, but I do agree, I think your right that bringing them into people’s environments, our own environments where we can actually start to live with them and figure out what that means for us as a city, as society, as culture, whatever the case may be that’s an important part too. We have to learn how to work together with these new technologies or concepts in a way too. Again, I love the idea of the parking garage as a hub for conversations, for the transportation network, for energy, which is something you brought up previously with the solar. I was curious when we think about upgrades to buildings and a beautiful structure on a roof with solar panels along with gardens and work space on the top of a parking garage. That all sounds amazing, but it also sounds really expensive. As you guys started to think about this project, what were the conversations there around the cost of actually making this thing come to life? Scott: We started with a very modest idea about using the structure almost as it was, and from there as other community groups got involved in conversations about how they would like to use the space [the vision] expanded, we were thinking about costs all the way along. This project hasn’t been implemented yet, so we’re still looking at budget issues and whether this is feasible, but in the initial view in the parking structures that are already there, all the macro-architectural elements are there. To add solar to the roof, in some cases that part of a program that can be funded through an external program, which basically bears the cost of that infrastructure and creates a partnership with you. Depending on the energy flows, whether that’s into the grid or whether that’s captured locally, there’s a lot of different cost models for the solar part. What we found is that in the city there’s already organizations and groups that have their own budgets and visions that we were hoping to draw together into this. So, the community movement through New York is very strong, so the idea of offering space to the community garden on this roof, basically they would be funding all of that additional infrastructure through their budgets, which were modest but enough to bring these planters and vegetable growing beds up to the rooftop. When we got as far as looking at building new community work space that brought it up to a different level, and a different level of approvals, et cetera. At that point, the community started basically looking at local and state funding options for grants, sustainability, and community development grants, and was successful in getting interest there. We’re talking now in the multiple hundreds of thousands of dollars to actually built workspace on the roof of this, whereas initially on a bike level we’re talking about using existing space at the ground level, opening up a wall that separated the building from the sidewalk. Not including the cost of money, but it’s not a structural change, it’s more sort of the skin of the building. Options and modularity, sort of incremental change. The vision for Green Hub more broadly is that this could be done a very low budget level in partnership with the owner of the structure, whether that’s the city or a property owner/developer that is looking for improving their contribution to the community, the image of the structure, and getting people engaged and involved. Jessica: Got it, got it. That’s real, again, very helpful to think about. I think sometimes when we envision change it feels like an all or nothing, and it’s exciting to hear that you’ve thought through options. Regarding the community, what types of work have you done around working with others? You mentioned various folks chipping in on the budget for programming, or one piece here, one piece there. Kind of a similar question to the cost, is this concept something that only works in New York and San Francisco, and London, where there’s money floating around for fun and innovative projects like this? Scott: Well, certainly community partnerships are key, and so I think establishing partners that have neighborhood improvements as a core interest is really important. There are some great organizations in New York to do that, we’ve got neighborhood improvement districts, business improvement districts, we have lots of bicycling advocacy groups here, et cetera. We have started to build a network of these community group partnerships to fund, staff, promote, et cetera, the project. Those exist in many, many cities. I think the question of the shape that a Green Hub might take in one city or another really depends on what those existing groups are, and maybe even developing new ones. The infrastructure and budget modularity I think is also paralleled by the types of community activism and community leadership and private development funds that are available. I think there’s always going to be a combination of funding from governmental and non-governmental and private sector to make something like this happen. Jessica: It’s so interesting. Again, I’m also an avid bicyclist, and one of the things is we think about the technology of a bicycle, again it has not significantly changed in hundreds of years, but the bicycle’s role as a technology and connector in the transportation of the future I think is coming full circle. I think about so much of the emphasis right now on active transportation, whether that’s walking or biking, and the impacts in our contemporary American society anyway around physical inactivity with obesity, where the numbers are scary, right? It’s like three-quarters of Americans, U.S. adults, will be qualified as obese in the very near future. Diabetes, strokes and things. Jessica: When you think about, again, the community impact, it’s more than just New York and San Francisco hipsters riding on a bike, right? It potentially has much greater impact. Again, that’s why I love the bicycle as a simple and humble technology. Speaking of humble technologies, something else that we were chatting about before we got on the call is the idea of the materials that go into the building. Concrete is something that is under appreciated, but there are other technologies too that might apply here. I know you guys have been doing a lot of researching in about the use of wood in architecture, does that have a role in how we think about parking garages today and in the future? Scott: I think it does, and it may apply to new structures that are being built, but it’s very important to think about where our materials come from and what their impacts are. Concrete has an amazing quality, it’s a very energy-intensive material, and for every pound of concrete it produced a tenth of a pound of carbon dioxide, which because concrete is very, very heavy and a tremendous amount is used, produces millions and millions of tons of CO2 every day, the amount of concrete that’s used around the world. It’s a real problem, and environmentalists recognize and anyone involved in climate change recognize that concrete is one of the biggest contributors to CO2 production, and therefore global warming. We have to really think carefully about that. Wood on the other is the exact opposite. Wood is really a solar powered building material; it uses the power of the sun through photosynthesis to take carbon dioxide out of the atmosphere and turn it into a building material. It’s like a solar powered 3D printer; it’s an incredible building material. We say it sequesters carbon; that means it’s pulling it out of the atmosphere and turning it into a hydrocarbon, and it’s a material that we can now use to build tall, very strong buildings. Around the world, there’re examples now of buildings up to 20 stories tall built entirely out of wood. The new technology, it’s called cross-laminated timber, or mass timber, and we can use it for big heavy slabs, floor slabs, walls slabs, columns, and beams. We’re able to use different types of wood, and even shorter pieces of wood that are laminated together, and because they’re large, chunky, heavy components they’re not susceptible to fire in a way that we might think that they would be. Heavy timber construction has always been considered a very fire resistant way to build because it’s difficult for fire to penetrate and consume large, heavy pieces of wood. Light wood buildings, very fire susceptible, but heavy timber buildings are not. People are actually using it today to build parking garages; it’s amazing. Imagine yourself with an electric car driving into a wooden parking structure, picking up your bicycle, scooting around the city, having your coffee in the sidewalk cafe and walking up to the roof to get some vegetables or flowers or something in the garden on the roof. These are things that are totally available and doable right now that really represent that integrated urban vision. Jessica: Scott I think that’s a really fascinating thing to think about, this intersection of what we perceive as old technologies or things we’ve moved past and humble ones coming full circle back together again with electrical cars and solar panels integrated into an dense urban city. So Scott, the vision for Green Hub, it’s a lofty one, right? It’s bringing people back together. What does that mean for cities of today? Scott: Well, when you describe the parking structures of old, and they felt like a more urban, dense, thoughtful structure, I really think that’s the direction we’re coming again. We’re looking at cities as a place where people, and things, and ideas come together. That’s what cities have always been; places for exchange, places of density. In the 1950s things started to kind of spread apart, and unfortunately, the car was part of that. Freeways and automobiles where essentially pulling things apart. Cities became less dense in many cases. In some ways the parking structures of that time were emblematic of this sort of sprawling space, and not necessarily that thoughtful, dense granularity that cities have always represented. But we’re coming full … it’s so cool to see how the idea of the city just in general where, again, people, ideas, infrastructures are drawing things together. I mean that’s what a hub is. It’s the center of activity; it’s the center of people. It’s intersections. The Green Hub is a pilot to see if we can bring things together in an elegant way that will inspire people to think differently, communicate differently. It would really be because … A showcase for what the city can do if we work together to create it. Jessica: To create that space, and really the opportunity to reconnect. I love it, and I love that the parking garage could be that type of environment. Scott: Who would have thought that the humble parking garage could actually be an icon of a new urban experience. Scott: I think that’s really exciting. Jessica: Yup, yup. Perfect. Thank you so much, Scott. This is great. Scott: It was great to talk to you, Jessica. This video of an automated parking system in Japan that retrieves and stores bicycles underground just might make you think differently about why and how we give so much space to parking cars here in the U.S. Plus the clip is just plain fun to watch! Guess the mystery sound for the upcoming episode in the link on that site or give us a question to the mailbag!